There’s one ingredient that you will surely find in your kitchen cupboards that can work miracles to your skin, hair and nails, t is baking soda that will enhance your beauty in many different ways that we will present to you in the following list. If you are suffering from acne breakouts, all you need is some baking soda and the problem will be solved, instead of using harsh chemical products that may worsen the problem, try applying a paste of baking soda mixed with water on the acne to fight the infection with its antiseptic and anti-inflammatory properties that are found in baking soda. 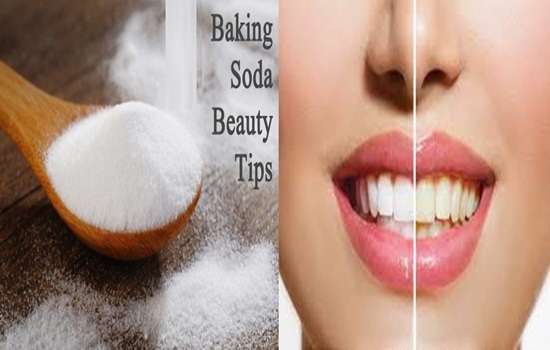 Another way baking soda can enhance your beauty is by whitening your teeth, it acts as a mild abrasive to remove yellow stains from the teeth, it also contains bleaching properties and it removes plaque by neutralizing the acids produced by bacteria in the mouth, wet your brush and dip in in baking soda and brush your teeth with that once a day for a week. 3- It Improves skin Complexion. Uneven skin tone is a problem many women around the world suffer from, baking soda is an inexpensive solution to this problem that can be more effective than chemical formulas, it helps balancing the pH levels within the skin which is very important in order to maintain clear and clean skin. Mix enough baking soda with rosewater to form a paste apply that paste to your skin and allow it to sit for one minute then rub off gentle with the tips of your fingers to exfoliate , wash with lukewarm water and moisturize after you finish. 4- Lighten yellow or stained nails. You won’t have to hide your hands in gloves again or even have to apply nail polish if you don’t want to, if your nails are yellow stained, use baking soda to bleach them and bring them back to natural color, dip your hands a cup of warm water with two tablespoons of baking soda mixed in for five minutes every day. Baking soda can also help with nail fungal infections due to its antiseptic properties, dipping the hand or foot with the infected nail in a solution of warm water and baking soda can kill of the infection, but you will need to use this remedy regularly for at least two months.